Thanks David, your recollections & thoughts parallel mine in this respect.The 1872 map above shows a terrace of only half a dozen properties whilst a later (1899-1900) map shows their number increased to 18. I’ve looked at several maps from the mid 1800’s onwards searching for other likely ‘cottages at the rear of the Hesketh’ but without success. That terrace backing onto The Mount is the closest group of properties to the River Gele (as opposed to individual buildings). They subsist on the 1913 1:2,500 OS Map, even as late as the 1938 1:10,560 edition. By 1961 however the Tanyard grounds have extended onto the land at the rear of Penisardre (the properties on Water St. between The Mount & The Tanyard) and the terrace is no longer shown, probably demolished. 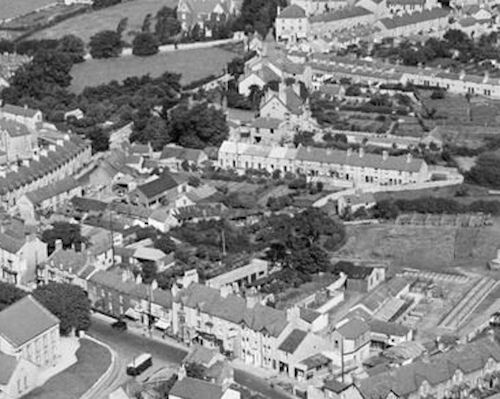 I’ve several aerial images of the town which includes the terrace, but they all date to c.1928. Circumstantial evidence would seem to indicate that, from their location alone, they would logically have been called Mount Cottages – unless anyone else can advise us otherwise. David, I think Delyth MacRae may have solved the matter for us with a comment she made on 30 July 2012 when she said ‘There were also 4 small cottages situated in the Mount, on the triangular piece of land just after the bridge from Water St called Mount Cottages and the Tannery family were born there’. This was in connection with the Britain from Above photos of Abergele. As the view is not that dissimilar to the map image above, I’ll try to post the relevant cropped part below it. Have a look at the cottages below the right hand end of the terrace in the centre of the image. Hi nigel, Yes I agree with Delyth concerning the small cottages at the back of the Hesketh and that would certainly explain the comments during the flood which ellis Wynne refers to. However, noone has been able to clarify the name of the row of cttages that can be clearly seen which were obviously demolished for the tan yard. From the style of them I wonder if they were built at the same time as Peel Street.Hopefully Delyth can help us. I’ve found some further information on the various properties near The Mount, courtesy of EWW’s book (pages 86-87). Starting with the Numbers then and on up Water Street, he lists Llys Onnen (formerly Jasmine Villa) then Brooklands (ex Fron Deg). It is the next sentence which caught my eye ‘Then there was a small house with a bedroom reaching across the road that leads to Mount Pleasant.’ I wonder if that was the name for the Mount at that time or of the terrace we’re querying? He continues ‘Next was the furniture shop. There was a tavern called the “White Horse” ‘. Trawling through the 1851 Census this morning, I found that it was run by one William Jones (66) who lived there with his wife Anne (51) and their daughter, also Anne (15). Just to confuse matters though, the 1851 Census also lists 3 properties in Mount Square immediately prior to the Penisardref entries!! Penisardref (sic) was the old row of buildings running from Nelson House down to the end of the Mount and facing the Tanyard. They were replaced in later years by the current Penisadre terrace of buildings as I understand things. I don’t know if the Rate Book of 1859 or the 1862 Plan of Abergele that EWW mentions (pg. 77) still exist (at the Town Hall perhaps?). Reference to those might provide a definitive answer. Peel Street by the way was built prior to 1829 whilst that part of the ‘Mount Terrace’ nearest to The Gele appears to have had a further 12 houses added to the original 6 buildings sometime between 1872 and 1899 according to old maps. Hi nigel, your begining to come round to my conclusion in that I believe from EWW’s book and a few other sources that the row of cottages eventually absorbed into the tanyard were in fact mount pleasant. It is really the only conclusion I can come to. What I don’t understand is there is little reference to them anywhere. I’ll e mail, Delyth and see if she can help, maybe there is something in the town Hall records that can answer this question definitively. As you say David, puzzling, especially when you consider that they would probably would still have been in existence, even in derelict form, within the living memory of some of the locals who are still alive today. As I mentioned above, maps show they were still there in 1938 but gone by 1961. I’ve just ordered a copy of J R Ellis’ 1948 book ‘A History of Abergele & District’ which might hold further clues. EWW spoke highly of it & used it for much of his research. The row of cottages just above point 744 in the map above, and then extended towards the river, as shown in the photo, are Mount Pleasant Cottages. There were 17 dwellings in total. The old wall to the mount pathway is indeed the only remnant of them, but as to whether it is the front or rear boundary wall is unclear as I’m not sure if the cottage entrances were oriented to the north or south. To confuse matters, there were also 2 cottages somewhere (I’ve not yet pinned down a precise location) in the vicinity of the old police station on Llanfair Road called Mount Cottages….. Welcome Andrew. Great to hear your voice on AbergelePost. Thanks for this contribution to the discussion. Which got me thinking that I knew something from somewhere, so I checked. The 1901 Census places two cottages referred to as ‘Mount’ behind Chapel Street. Behind which side? Well, the enumerator had just been up and down New Street, so I’m guessing that side. They were still there in 1911. They were 2 room dwellings. One of the occupants was an 11 year old Owen Jones. He would be killed in action 20 April 1918, and was Abergele’s youngest victim of the Great War, being just 17. Hello Andrew, many thanks for your comments regarding Mount Cottages, the ones in the vicinity of the Tanyard and as Gareth has already said, welcome to the site. 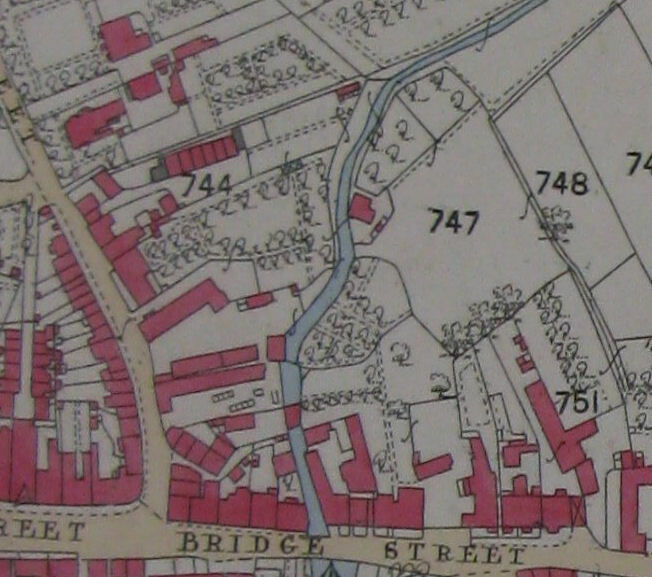 With respect to the other 2 cottages of that name, in the area of the old Police Station on Chapel Street, I’ve managed to dig out and copy the relevant sections of the same 1872 map that produced the image at the top of this page. As luck would have it, a join runs down the middle so the combined image doesn’t line up perfectly. I’m hoping this may give you some insight as to properties near the old Police Station to assist your search, even though none are marked Mount Cottages. That would be too easy wouldn’t it! I’ve also located an aerial photo from approx. the 1930’s, taken from almost directly above the area in question, which does show a building (or 2 small buildings) adjacent to the Police Station. I’m somewhat short of time so those images will hopefully appear here shortly. I trust that will help you identify them. Let us know how you get on. Warm regards, Nigel Hilton. Thank you Nigel. I will study the additional materials with interest.